The two acre site on the extensive, beautifully landscaped Wellesley College campus is located along a pathway that winds through a wooded area on one side of Lake Waban. The journey through the landscape is part of the experience of this permanently-sited work, offering an alternative approach to traditional notions of public art which is usually placed in an urban context. The Woodland Garden is meant to be discovered, stumbled upon, as one travels along the forest trail. 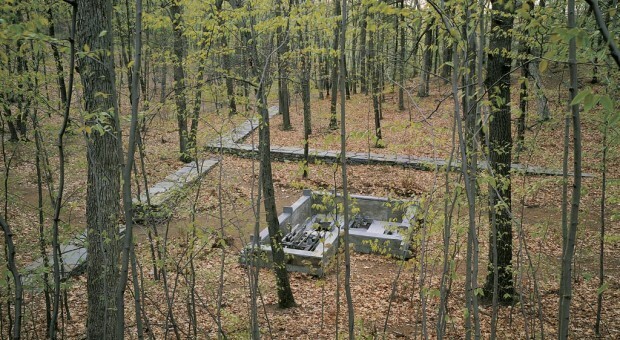 The site is defined with low stone walls that serve as both threshold and boundary, referring to the abandoned stone walls and foundations found throughout New England’s reforested landscapes. The sculptural element is sited in a hollow between two small hills in the landscape. Low split-stone slabs and a cut capstone rise two feet above the ground plane and define the upper edge of a chamber that extends four feet below the ground. The sunken chamber contains sculptural layers of cut granite and cast bronze. Over one hundred planted indigenous silver beech and red maple trees, along with wild blueberry and ferns, were planted as a part of the project to blend into the existing woodland flora. This project was sponsored by the National Endowment for the Arts, LEF Foundation, Davis Museum and Cultural Center and the Massachusetts Council on the Arts.